Elise checked out FamilyFun Birthday Cakes from the library (is she a girly girl or what?) and when Andrew spotted these, he begged to make them for a team party. 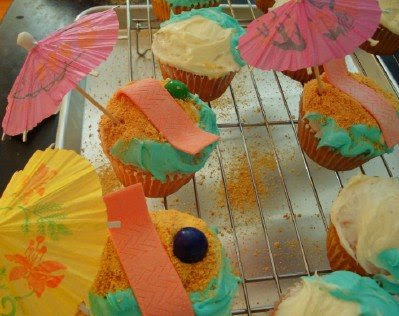 You can see the free beach cupcake directions online. Walmart sells 144 little umbrellas for $2. However, if you find them in the summer section, the same 144 umbrellas cost over $4. Either way, that's a lot of umbrellas. I think we'll surprise my husband with a tropical dinner Friday night! Wow, that's a big mark-up! I bought those umbrellas (probably from the summer section) years ago. I used ONE on a beach cake and then never found a use for the other 143. I think they went the way of a garage sale. I'm so glad I've reformed my ways. Those are too cute! I'm working on a mermaid birthday party for Brenna this summer - what is the sand made out of? What fun cupcakes! I'd never have thought of this. The sand is graham cracker crumbs. You can click through to the Family Fun link to see complete instructions and supplies. I also saw a link for a mermaid Barbie cake at Momadvice today you might want to check out. Cool! Your's look waay better than the cupcake on their website!That is one sad looking cupcake! I'm so excited to see these LOL-I just finished making some Family Fun ideas for our school Fun Night cupcake walk (One set looked like a mini popcorn tin and the other one was a frog). We're looking ahead to next year when the theme is Luau--I'll so be keeping these on my list of ideas. We were recently in Jamaica for a family wedding and Alek loves the tiny umbrellas! How about some fun virgin smoothies for the kids this summer? My daughter has gotten that book from the library too. It is lots of fun. Your cupcakes turned out very cute!